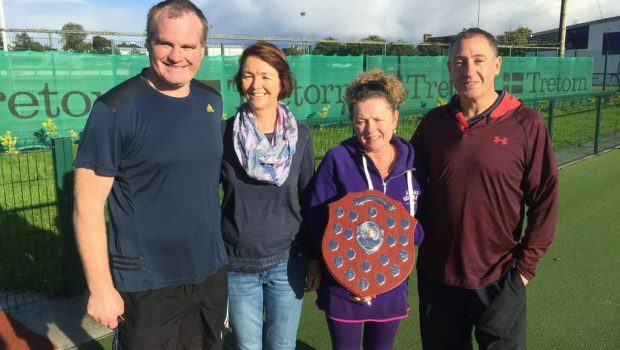 Along the way defeating Claremorris, Manorhamilton ,Galway and then Castelbar in the final on Sunday 25th September at Claremorris TC winning 15 out of 16 matches played in course of the competition in doubles and mixed. Div 2 Team: Nick Miller (Captain), Stephen Cunningham, Ann McTiernan, Ann Longworth, Emer Concannon, Jo Mullan and Jeff Kay. Runners up against very tough competition in the final to Galway in the final on Sunday 25th September at Claremorris TC. Div 1 Team: Marina Swann (Captain), Noreen Cassidy, Niall Butler, Graeme Watt, Stephen Cunningham and Emer Concannon.